It’s a witty expression of a keen observation by the poet that, for all practical purposes, married the daughter of the author Thomas Mann. Of course this was after both Erika Mann and her father were to see their citizenship revoked in Nazi Germany and Mann fled to the United States, first to Princeton University to teach, but ultimately to Pacific Palisades, California, in 1941, to set up a family dwelling and write, just a couple of miles down the street from where the American Cinematheque’s Aero Theater now stands in Santa Monica, where from September 30th through October 4th (and at the REDCAT on October 5th) the Goethe Institut Los Angeles is showing the “German Currents” series of recent films. 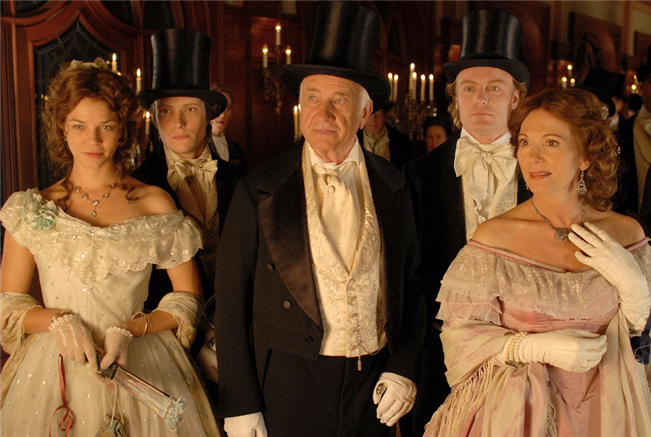 Writer-director Heinrich Breloer, producer Matthias Esche, and actor Armin Mueller-Stahl will be on hand for the screening of their 2008 film, Buddenbrooks: The Decline of a Family from the renowned novel by Thomas Mann. In a chapter of Joseph and His Brothers that he wrote in California, Mann described Joseph, the essence of the exile, as at once “naïve and calculating,” and he wrote the same about himself in his personal journals. Often described by his biographers as more “politic” than “political,” he left the latter to his brother, Heinrich, who was at the same time drawn to Hollywood where he met another tier of political persecution under McCarthyism, and to two of his children, Klaus and Erica, though Thomas Mann himself became increasingly outspoken against nationalism and the Nazis once he entered the U.S. To navigate American society with success, which he did achieve all over again, he had much to learn, and to un-learn. Perhaps his early lessons and autobiographical reflection upon them taught him the most. A few years before he was awarded the Nobel Prize for Literature in 1929, he addressed the city of Lübeck, Germany, to let the citizens of his home town know exactly how his epic novel, bundled up and sent off to a publisher just after his 25th birthday — the 800-page Buddenbrooks: The Decline of a Family — was really a reading of them. The critics compared the novel to a heavy dray grinding its way through sand. Yet in tracing the history of his own family in Lübeck, Mann had also rendered a fragment of cultural history, in particular, a psychological portrait of the German burghers that revealed the European patrician sector in general: the process of “the loss of bourgeois values, bourgeois competence, through differentiation, through the excessive development of sensibility.” It wasn’t just the hyper-sensitive musical prodigy Hanno and his uncle Christian, passionately drawn to the theatre, who were to drive the narrative with their oppositional force, but even Hanno’s father, Thomas Buddenbrook, proprietor of the Protestant business ethics of the North, and his sister Tony, who would aspire to these ruthlessly competitive values complacently. Thomas Mann was fascinated by the unconscious and the extent to which every significant action sprang from the “will” that was inadequately or belatedly informed by the intellect. “How often in my life have I not observed with a smile that the personality of my deceased father was governing my acts and omissions, was serving as the secret model for them?” Mann wryly asked himself. And there was his mother, with her “blithe southern disposition,” of Portuguese Creole descent from her father’s days of doing business in Brazil. The ethical bent that Mann saw as the bourgeois spirit incarnate had always to contend with the purely aesthetic impulse that meant a devotion to beauty and pleasure but also nihilism and “the vagabond’s flirtation with death.” Yet this was all Lübeck as a personal way of life, a private mood and attitude. Regarding the images he painted, he claimed to make use of the palette of the sea: “If my colors have been found subdued, not luminous, the reason may be certain glimpses through silvery beech-wood trunks of a pastel sea and pallid sky, upon which my eye rested when I was a child and happy.” Referring to Lübeck’s “natural frame” in addition to the Baltic Sea, Mann insisted that none of the “excessive azures of the gracious South” could diminish the “pure, fresh, and idyllic impact” of his impressions of the district of Eutin, Mölln, and Ukleisee that were in his books, but not as overt word-paintings. Thomas Mann encouraged his readers to consider various “modes of being”: for example, the atmospheric as opposed to the physical, or the acoustic instead of the visual. People, especially artists, he maintained, have been classified as either aural or visual, some experiencing the world chiefly through their eyes and others, mainly through their ears. He even went so far as to attach the latter sensibility to the North. He perceived its landscape acoustically. Mann described his writing process as one in which the book “swelled under (his) hands… hibernated during the winter, awoke again, proved to be as absorbent as a sponge, grew by accretion like a crystal, (and) drew all the elements of the times to itself” — an organic growth and refinement to allow the scale of the project its own cadences and time frame. Flee he did, within seven years’ time, landing in Pacific Palisades sooner than later and flying through the autobiographical fictions that continued to fill his pages. Buddenbrooks: The Decline of a Family had already been adapted to the silent screen and was to see four other incarnations for film and television. They tend to be longer than the latest, by Heinrich Breloer, even up to ten hours, pointing to one of the challenges in preparing visual media from a novel of this scope. But as is suggested in the above introduction, other questions arise: how to convey Mann’s meticulous detail, his sense of impending fate over prolonged time, the non-theatricality of the family’s cool, middle-ground ethics, a temperate palette and lighting register that still save the novel from becoming a sentimental romance. Locations, sets, and costumes are another matter, commanding a budget. Selection and omission, condensation and expansion are always at issue in adapting literature to the screen. Thematic focus and tone are concerns; yet they can vary from one medium to the next without sacrificing artistic merit for fidelity to the source and vice versa. 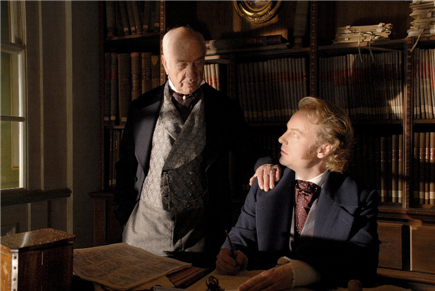 Heinrich Breloer lavishes 152 minutes on Mann’s four generations of his mercantile family between 1835 and 1877, years that saw the 1848 Revolutions and the North German Confederation on the way to the establishment of the German Empire. Mann allows these events to intervene, giving them their space although in perspective, foregrounding the daily pressures of the Buddenbrooks’ buying and shipping and selling, the precise and concrete details of the family’s Protestant and patrician rituals and civic duties, and their financial threats and responses, all of which make up their “ethics” and therefore their cumulative “destiny.” Thomas Mann uses a symbolic aesthetic to express the interior and exterior tensions between the worlds of art and commerce, a dynamic that appears to compel screenwriter/director Breloer, but differently. 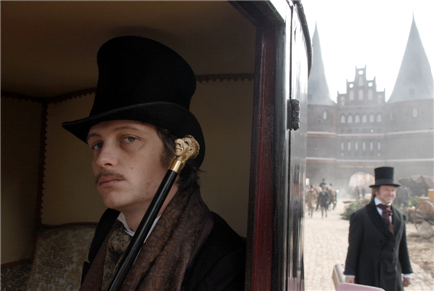 Having previously worked in television (presenting the Mann family, no less), Heinrich Breloer here brings a steadicam world to Lübeck’s way of life, through our own century’s lens. His camera roves and zooms as if Scorsese’s in The Age of Innocence, and Armin Mueller-Stahl whispers as softly as Brando in The Godfather, even if more eloquently. The film opens with the Hagerströms and the Buddenbrooks taunting each other, as children racing each other in wagons and doing damage, kissing each other and slapping for it. Half a minute later, they are adults. To boot, we’ve skipped the whole first generation. Tony, their sister, about to be financially negotiated into a marriage, is robust and defiant, nearly altogether devoid of restraint and possessed of 21st-century manners and mannerisms that would be highly uncouth and unacceptable in her day and social order. She is a storm of refusal (like the rainstorm that follows her home in departing from her new-found lover): “Nein, nein, nein!” she cries regarding a forced engagement to Herr Grünlich, her heart consumed with the harbor pilot’s son she met a minute ago, who stripped to the waist before her on the beach to go charging into the waves for a swim and shouted from the water his secret — he’s a “Dangerous Democrat!” It’s about all we hear of his politics, but the chemistry is there, which seems to be what counts in the film, setting all improprieties aside (he proposes to her through her bedroom window, Tony in a delicate white nightgown). In the film, within moments of Jean Buddenbrooks teaching Tom, “We only know the worth of a shipment when the goods have been sold for a profit,” Grünlich is garnering an extra ten thousand marks above the seventy thousand set aside for a Buddenbrook dowry and the wedding is on. Tom is sent off to Amsterdam to extend the firm’s interests and his own, and Christian is headed to London to do the same. It is precisely the matters of the heart (and the flesh) and the sibling rivalries that will prevail to tell the balance of the story. To his credit, Breloer has chosen a superb cast and they take full command of their roles. The three siblings of the one generation — Jessica Schwartz as Tony, Mark Waschke a Tom, and August Diehl as Christian — carry the film with panache. Their work is well complemented by that of Léa Bosco as Gerda Arnoldsen and Raban Bieling as Hanno, who are married into and born into the family, respectively, and join its demise. Cast: Armin Mueller-Stahl, Iris Berben, Jessica Schwartz, August Diehl, Mark Waschke, Raban Bieling, Léa Bosco, Maja Schöne, Nina Proll, Justus Von Dohnanyi, Martin Feifel, Alexander Fehling, Fedja van Huêt. Color, 35mm-to-HD, widescreen, 151 minutes. In German with English subtitles.